Heligmosomoides polygyrus is a widespread gastro-intestinal nematode infecting wild Apodemus (wood mice) throughout Europe. Using molecular and morphological evidence, we review the status of Heligmosomoides from Apodemus agrarius in Poland previously considered to be an outlying clade of H. polygyrus, to further resolve the status of the laboratory model species, H. bakeri. Morphological analysis of the male bursa and the synlophe, and molecular analyses of concatenated nuclear (28S rDNA, ITS1 and ITS2) and mitochondrial (CO1 and cytb) genes, of Heligmosomoides collected from Apodemus agrarius from two sites in Poland and comparison with related heligmosomids from voles and mice in Eurasia. Heligmosomoides neopolygyrus, a heligmosomid nematode from Apodemus species from China and Japan, is recognised for the first time in western Europe infecting Apodemus agrarius in Poland. It can be distinguished from H. polygyrus by the filiform externo-dorsal rays of the male copulatory bursa and the small, equally distributed longitudinal crêtes on the body. Specimens from A. agrarius are 20% different at ribosomal (ITS1 and ITS2) nuclear loci, and 10% different at the mitochondrial cytb locus from H. polygyrus, and in phylogenetic analyses group with the vole-infecting genus Heligmosomum. Despite morphological similarity, H. neopolygyrus is only distantly related to H. polygyrus from western European Apodemus, and may be more closely related to vole-infecting taxa. It was brought into Europe by the recent rapid migration of the host mice. Inclusion of H. neopolygyrus in phylogenies makes it clear that Heligmosomoides is paraphyletic, with the pika-infecting Ohbayashinema and the vole-infecting Heligmosomum nesting within it. Clarification of the European status of H. neopolygyrus also allows H. bakeri, the laboratory model species, to be seen as a terminal sister clade to H. polygyrus, rather than as an internal clade of the latter taxon. Gastro-intestinal (GI) nematodes of the genus Heligmosomoides are well known parasites of wild rodents, which through their strong immunosuppressive effect , may be considered architects of helminth and pathogen communities in these hosts . The laboratory model, H. bakeri infecting Mus, is one of the most intensively studied GI nematodes, with detailed accounts of its immunological and molecular interactions with the host ,. Nevertheless, knowledge of other species in the genus is highly confused, and even the independent specific status of H. bakeri, as distinct from the Apodemus-infecting H. polygyrus, is controversial and bitterly debated –. A problem with the taxonomy of Heligmosomoides concerns the poor standards of description and lack of type material for older species such as H. polygyrus, originally described as Strongylus polygyrus by Dujardin . This problem was exacerbated by the finding that, based on comparison of a fragment of the cytochrome b (cytb) mitochondrial gene, H. polygyrus exists in its wild hosts as numerous distinct and geographically discrete clades –, which may or may not represent cryptic species. Indeed, Cable et al. concluded that the problem lay not with our understanding of the laboratory model H. bakeri, but with our lack of knowledge of the broader H. polygyrus clade. Since then, Behnke & Harris  have highlighted the similarity at molecular loci between H. polygyrus corsicum, a taxon infecting M. musculus on Corsica and Apodemus spp. in Asia Minor ,, and usually considered a subspecies of H. polygyrus, and H. bakeri, and it is possible that these two forms are part of the same species. If H. polygyrus corsicum and H. bakeri can be shown to form an internal clade within H. polygyrus, then there can be little support for considering them as distinct species. On the other hand, if these taxa represent distinct terminal clades, then the hypothesis that they are independent species would continue to deserve consideration. Scrutiny of the phylogeny of Nieberding et al. does indeed reveal an additional H. polygyrus clade (their clade 4) which lies outwith the entire sampled H. polygyrus/H. polygyrus corsicum clade. This clade, from Russia and Poland, predominantly from the the striped field mouse Apodemus agrarius, was considered evidence for a northern glacial refugium for H. polygyrus in Central Europe . This clade presents an important test of the null hypothesis that H. bakeri and H. polygyrus are part of the same taxon, and for this reason we have undertaken the present study of Heligmosomoides from A. agrarius in central Europe. The results make it clear that this clade is not identical to H. polygyrus, but can be linked instead to H. neopolygyrus, a species previously known only from Asia east of the Urals. This species not only sheds light on the evolution of Heligmosomoides as a whole, but also appears to represent another example of the A. agrarius parasitofauna imported into Europe with the natural westward migration of its host. Heligmosomoides were collected from A. agrarius live-trapped near Wrocław and Gdańsk in Poland. Comparative material of H. polygyrus was collected from A. flavicollis from these sites, and from A. sylvaticus from Norway, the UK and Ireland. H. glareoli was collected from bank voles (Myodes glareolus) from Scotland and the island of Anglesey (Wales), and representatives of Heligmosomum mixtum were collected from the same host from Eastern Poland (same site as described in Cable et al. ), and from Wrocław. H. costellatum from Microtus arvalis was also available from the latter site. Material of H. polygyrus corsicum, from the same collections used in a study by Nieberding et al. , was also examined. H. bakeri was obtained from the Nottingham laboratory colony of this species . Full details of collection sites are given in Table 1. Animals were euthanised and dissected within a few hours of collection and worms found collected into 80% ethanol for long-term storage at −20 or −80°C. Rodents were collected according to the legal and ethical guidelines current in the countries where they were sampled. The synlophes of H. polygyrus and H. neopolygyrus were studied using 2 μm transverse sections of methacrylate-embedded (Sigma) females stained with 0.1% methylene blue. To determine the 3-dimensional structure of the synlophe, specimens were also stained in 0.1% silver nitrate following the method of Khrustalev and Hoberg , modified by developing the silver stain by exposure to bright daylight for 5 minutes. For study of the caudal bursa of males, worms were cut just anterior to the spicules and extracted in CellLytic bacterial lysis reagent (Sigma) for up to 48 h before mounting in lactophenol for photography. Phase contrast photography was performed using a Leica DM600b with Leica DC500 camera. Voucher specimens of H. polygyrus and H. neopolygyrus have been deposited in the Natural History Museum (NHM) Oslo (accession numbers NHMO C5921-C5923), NHM London (accession numbers NHMUK 2014.2.14.1, NHMUK.2014.2.14.2-7, NHMUK.2014.2.14.8-10) and the NHM of Wroclaw University. Representative DNA samples are deposited in NHM Oslo (accession numbers NHMO NEM 0001–0019). A total of three specimens from A. agrarius (2 from Wrocław, one from Gdańsk) were used for molecular analysis. As the other taxa all had representative sequences within Genbank, only single specimens from each site were sequenced. DNA was extracted using the E.Z.N.A.® Tissue DNA Kit (Omega Bio-Tek, USA), and amplified using PCR specific for 3 nuclear markers (internal transcribed spacers 1 and 2 [ITS1, ITS2], and a fragment of 28S rDNA) and 2 mitochondrial markers (fragments of genes encoding cytochrome oxidase I [CO1] and cytochrome b [cytb]). Primer sequences were drawn from the literature ,,– (for detailed information see Table 2). PCR conditions included initial denaturation in 95°C for 5 min, followed by 35 cycles: 45’s denaturation (95°C), 30’s annealing (50°C for CO1, 52°C for cytb, 54°C for 28S rDNA and 60°C for ITS1 and ITS2), 30 s elongation (72°), and a 5 min step of final elongation (72°C). PCR products were sequenced using the same primer pairs, and chromatograms inspected visually for ambiguities. Alignments were produced using ClustalX within the Mega 5.0 package  followed by visual inspection. Phylogenetic analysis was conducted using a Maximum Likelihood algorithm implemented in RaxML vs 8.0  via the CIPRES Science Gateway portal . Nuclear ribosomal analysis was conducted on concatenated sequences (1704 bp) partitioned into 28S, ITS1, 5.8S and ITS2 genes, and included Ohbayashinema erbaevae, previously described as a representative of a sister genus to Heligmosomoides and Heligmosomum,, H. kurilensis kobayashii and a variety of H. polygyrus sequences drawn from GenBank (Table 3). The concatenated alignment included sequences represented at only one or two of the 4 loci included in the alignment, but overall each nucleotide site was represented by between 66% (28S, central region of 5.8S) and 100% (central regions of ITS1 and ITS2) of the aligned sequences. After computation of the best phylogeny (100 bootstrap replicates), identical and closely similar sequences were removed iteratively to include H. polygyrus diversity without over-representing this taxon in the phylogeny. For CO1 and cytb a concatenated alignment (1411 bp) was produced including H. polygyrus sequences from each of the major mitochondrial clades identified previously –. Coverage in this case included 97% of all nucleotide positions within cytb and 42% of all nucleotide positions within CO1. Eleven isolates (35% of the total), including examples of all major clades, were represented at both cytb and CO1 loci. For nuclear ribosomal loci, the chosen outgroup was Nematodirus battus. For analysis of mitochondrial markers, Trichostrongylus axei was used as outgroup. To confirm the results obtained using the concatenated nuclear alignment, homology modelling of ITS2 was undertaken using the ITS2 database (http://its2.bioapps.biozentrum.uni-wuerzburg.de/; ) with the secondary structure for Trichostrongylus ITS2 originally presented by Chilton et al. in order to optimise the alignment (see Additional file 1). This optimised ITS2 alignment was analysed alone (Additional file 1) and also incorporated into the concatenated nuclear alignment. 1This subspecies was originally described from Mus musculus domesticus from Corsica; however, ITS1 and ITS2 sequences are available only for parasites collected from Apodemus mystacinus from Turkey and linked to specimens from Corsica by identity of their cytb sequences (). 2Sequences for H. p. polygyrus Jar and H. bakeri cytb are truncated relative to the other isolates. 3Sequence obtained through 959 Nematode Genome project (http://www.nematodes.org/nematodegenomes/index.php/959_Nematode_Genomes). ND indicates sequence not available for inclusion in the concatenated alignments (mitochondrial or nuclear). A blank cell indicates a taxon not included in the relevant alignment. Worms from A. agrarius were moderately large (females up to 15 mm), reddish, slender and strongly coiled, with a habitus similar to that of H. polygyrus. The synlophe consisted of 18–24 longitudinal (not diagonal or partially diagonal as in Heligmosomum) crêtes, diagnostic for Heligmosomoides as re-established by Durette-Desset ,. In cross-section, a clear distinction between the crêtes of the worms from A. agrarius and those of H. polygyrus was noted (Figure 1). In H. polygyrus, the crêtes were smallest in the dorsal right-hand quadrant of the worm and increased in size to the ventral left-hand quadrant, where the largest crête is located (Figure 1A), exactly as described by Durette-Desset . The size of the crêtes increases gradually and monotonically from the smallest to the largest. In worms from A. agrarius, by contrast, there was no gradual increase in the size of the crêtes from dorsal right quadrant to ventral left quadrant, and instead the crêtes were more or less the same small size around the entire circumference of the worm (Figure 1B). The long filiform spicules of the worms from A. agrarius were similar to those from H. polygyrus and H. bakeri, with a total length of c. 700 μm. The copulatory bursa of the male worms from A. agrarius was asymmetrical, with the right lobe c. 30% larger than the left lobe. The arrangement of the rays was similar to that of H. polygyrus, with one notable difference; the externo-dorsal rays of the bursa in these worms were filiform (Figure 1C), and lacked the swollen base characteristic of H. polygyrus (Figure 1D). The morphology of H. polygyrus and H. neopolygyrus. A) a cross section through the mid-region of H. polygyrus female; B) a cross section through the mid-region of H. neopolygyrus female; In both cases, the worm is oriented with the head away from the viewer, with the dorsal surface at the top of the image. Slender black arrows indicate the ventral crête of the respective worms; the short black arrows indicate the ventral left-hand quadrant where the crête is largest in H. polygyrus but not in H. neopolygyrus. C) bursa of H. neopolygyrus; D) bursa of H. polygyrus; White arrows indicate the externo-dorsal rays, showing the enlarged base in H. polygyrus but the filiform ray present in H. neopolygyrus. Where comparison with accessions in Genbank was possible, sequences from H. polygyrus, H. glareoli and H. bakeri were similar or identical to existing curated sequences and merely extended geographical coverage, and in some cases the number of loci sequenced. Material from Myodes glareolus from Wrocław identified morphologically as H. mixtum was identical with sequences in Genbank from M. glareolus in NE Poland (collected and sequenced by Cable et al. ) and with a sequence from Genbank (AJ971145) labelled ‘Heligmosomoides costellatum’ (sic) and deposited by Nieberding et al. . Our worms were identified morphologically according to the criteria outlined in Tenora et al. , and moreover the Spanish H. costellatum sequence is recorded as collected from Myodes glareolus, the nominal host of H. mixtum. We consider this, therefore, to be an erroneously labelled example of H. mixtum, and our own H. costellatum sequences to be the first of this species to be deposited in Genbank. The Heligmosomoides species from A. agrarius differed considerably at all sequenced loci from H. polygyrus. Across the 605 base 28S gene fragment, the worms from A. agrarius differed from H. polygyrus at 3 bases (0.5%), when the maximum difference noted (between H. glareoli and H. polygyrus) was 10 bases (1.6%). Across the combined ITS1/ITS2 alignment, the pairwise differences between the worms from A. agrarius and H. polygyrus was c. 5%, and even within the modelled 213 bp alignment of the stems in ITS2 (Additional file 1), there were 10 base pair differences (4.6%). The sequenced isolates of the worms from A. agrarius were identical at these nuclear loci. Across the 616 base pair cytb alignment, there were 27 base pair differences (4.4%), which were diagnostic of the worms from A. agrarius relative to H. polygyrus (other variable sites were also polymorphic within H. polygyrus), and within the 559 cox1 alignment, there were 40 (7.1%) base changes. The differences between these worms and H. polygyrus are therefore substantial at all sequenced loci. A single base difference (T269G) was noted between the two isolates (from Wrocław and Gdańsk) at cox1, while their cytb sequences were identical. A group of cytb sequences in Genbank (AM408290, AM408307 - AM408312, all from Poland) were also almost identical to the sequences from the worms from A. agrarius, differing by up to 3 bases (0.5%) while a further sequence (AM408303) from worms collected from A. uralensis in Russia east of the Urals, differs from these sequences at 6 bases (0.9%). The worms from A. agrarius clustered consistently with the genus Heligmosomum at both concatenated nuclear and mitochondrial loci (Figure 2A,B). Molecular analysis of the concatenated nuclear markers (Figure 2A) recovered two strongly supported clades within the Heligmosomidae, with Ohbayashinema erbaevi, H. glareoli and H. kurilensis kobayashii failing to cluster with either. One of the strongly supported clades (88% bootstrap support) linked the worms from A. agrarius with Heligmosomum costellatum and H. mixtum. The other strongly supported clade (92% support) linked Heligmosomoides polygyrus with H. polygyrus corsicum and H. bakeri. H. bakeri showed higher sequence similarity to H. polygyrus corsicum than to H. polygyrus polygyrus, which formed a sister group to the H. polygyrus corsicum/H. bakeri clade. Support for these two terminal clades was 96% and 91% respectively. H. kurilensis kobayashii was recovered with the H. p. polygyrus + H. p. corsicum/H. bakeri clade, but bootstrap support for this association was weak (66%). Ohbayashinema erbaevae was recovered as an unresolved polytomy within the clade including H. polygyrus, H. bakeri, H. kurilensis kobayashii and Heligmosomum, while the position of H. glareoli was unresolved but lay outside this main Heligmosomoides clade. Using a more conservative alignment including a subset of 216 bases unambiguously identified as lying within base-paired stem regions of ITS2, based on homology modelling with the Trichostrongylus/Camelostrongylus structure of Chilton et al. (Additional file 1), the clade including H. polygyrus, H. bakeri and H. polygyrus corsicum, but excluding the worms from A. agrarius, was recovered in 96% of bootstrap replicates, while the worms from A. agrarius clustered with H. mixtum in 70% of bootstrap replicates. No analysis revealed an association between the worms from A. agrarius and H. polygyrus. Phylogenetic analysis of the representatives of the Heligmosomidae. A) concatenated nuclear (28S rDNA, ITS1, 5.8S and ITS2) loci, B) concatenated mitochondrial loci (partial CO1 and cytb genes) The analysis was performed using the Maximum Likelihood algorithm within the RaxML package implemented via the CIPRES gateway. Bootstrap support calculated on basis of 500 replicates (only values above 60% shown). Analysis of concatenated mitochondrial markers also failed to recover a clade grouping the worms from A. agrarius with H. polygyrus to the exclusion of other Heligmosomoides species (Figure 2B). Four well supported clades were recovered using the concatenated alignment, although the relative relationship of these clades to each other could not be discerned. The first well supported clade (bootstrap support 98%) included Heligmosomum and the worms from Apodemus agrarius. The other well supported groups were H. glareoli (bootstrap support 95%), H. polygyrus corsicum/H. bakeri (bootstrap support 99%) and H. p. polygyrus (bootstrap support 89%). Heligmosomoides collected from A. agrarius in Poland appeared at first sight to belong to H. polygyrus, the common species recorded from Apodemus throughout Europe. The worms were red, slender and strongly coiled, with longitudinally orientated crêtes, typical of the genus as re-erected by Durette-Desset ,. However, examination at two concatenated mitochondrial (cytb and CO1) and four concatenated nuclear (28S rDNA, ITS1, 5.8S rDNA and ITS2) loci make it clear that this worm is quite distinct to H. polygyrus, and cannot be regarded as the same species. Indeed, this taxon does not even form a sister clade to H. polygyrus, and clusters rather with the genus Heligmosomum (H. mixtum and H. costellatum). The cytb sequences obtained in the present work link this taxon unambiguously with specimens from A. agrarius collected by Nieberding et al. from Poland (Lublin), previously misidentified because of lack of nuclear data as H. polygyrus. The cytb sequences of the Nieberding Polish material are also very similar to that (AM408303) of a specimen collected from A. uralensis in the region of Novosibirsk , suggesting that this taxon is widespread in eastern Europe and western Asia. 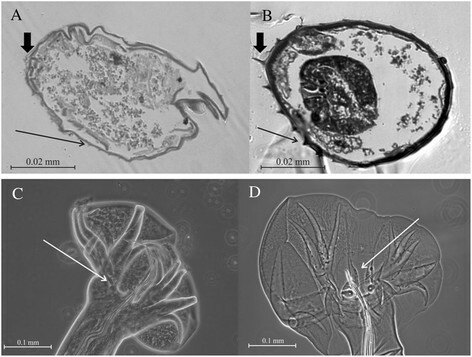 Four Heligmosomoides species have been described from Apodemus east of the Urals, and could be linked to the Nieberding Siberian cytb sequence, and therefore to the worms collected from A. agrarius. H. kurilensis was described from A. speciosus from the Kuril Islands but the male has a spicule of greater than 2 mm in length, compared to the 700 μm spicules for worms from A. agrarius. This species is not identical to the material considered in the present work, a view corroborated by inspection of sequences for this species deposited in Genbank. The second species from Apodemus in Japan, H. desportesi Chabaud, Rausch and Desset, 1963, is less well documented, but at least according to the habitus photographs presented by Asakawa and Ohbayashi , is a much more robust nematode, with a greater diameter which does not overlap with that of H. polygyrus, and with a symmetrical caudal bursa. This also does not appear to be identical to material collected in the present work, although there is some doubt because H. desportesi as redescribed by Asakawa and Ohbayashi  does not conform to the original description , and it has been suggested  that this material might be a synonym of H. polygyrus. No molecular sequences are available for this species. The third species from Japanese Apodemus seems a much stronger candidate for comparison with the worms from Polish A. agrarius. This is H. neopolygyrus, collected originally from A. peninsulae in Hokkaido. This has the same habitus as H. polygyrus, but the most convincing point of comparison concerns the slender, filiform externo-dorsal rays of the male bursa. This was noted as a specific character of H. neopolygyrus, as opposed to the basally swollen externo-dorsal rays of H. polygyrus, and is shared with the Polish material. The fourth species, H. asakawae from Urumchi, in Western China, has expanded bases of the externo-dorsal rays, and was also originally described as H. polygyrus; this appears to resemble H. polygyrus more closely than do the worms from Polish A. agrarius, but no molecular sequences are available. H. neopolygyrus has been documented on several occasions from the Asian mainland, as far west as Novosibirsk in Russia , and a detailed re-description was provided by Massoni et al. based on material from Sichuan. In each case the filiform externo-dorsal rays have been highlighted as the specific character differentiating H. neopolygyrus from H. polygyrus. Furthermore, the original description of H. neopolygyrus highlights the small, flattened crêtes of this species, which do not increase in size to the ventral left-hand quadrant of the worm in the manner noted for H. polygyrus, but instead remain small and similar in size, a further character differentiating H. neopolygyrus from H. polygyrus and shared with the worms collected from Poland (Figure 1). The morphological description of H. neopolygyrus from Novosibirsk  is serendipitous because the cytb sequence for a Heligmosomoides isolate from A. uralensis in Novosibirsk (AM408303) is closely similar to those from our material, and also to those from Polish A. agrarius sequenced by Nieberding et al. . Given the morphological and molecular agreement of the Polish worms with material from Novosibirsk, we identify the worms from A. agrarius in central Europe as H. neopolygyrus. The distribution of A. agrarius in Eurasia is discontinuous, with an eastern range centering on Eastern China and the Japanese islands, and a western range, extending from western China to central Europe. These two areas of distribution are separated by the Tibetan plateau. Should the molecular identity of H. neopolygyrus from Hokkaido be found to be different to that of specimens from Novosibirsk or the present material, the western form would require description as a new species; however, for the present we consider this to be unjustified, and consider these specimens to belong to H. neopolygyrus. The genetic distance between H. polygyrus and H. neopolygyrus from Polish A. agrarius is considerable. At both ribosomal and mitochondrial loci, H. neopolygrus is much more closely associated with Heligmosomum, and it is clear from the phylogenies in Figure 2 that Heligmosomoides as a genus is paraphyletic, including both Heligmosomum and Ohbayashinema. Conventional wisdom based on morphology suggests a) that H. neopolygyrus and H. polygyrus are sister terminal clades ,; b) that the Apodemus-infecting species are derived by host shifts from forms infecting voles ,,; and c) that the slender, coiled Heligmosomoides habitus is derived relative to the straight and stout Heligmosomum habitus. This latter assumption was implicit in Durette-Desset’s  resurrection of the genus Heligmosomoides Hall, 1916 to accommodate the spirally coiled forms; Heligmosomum Railliet and Henry, 1909 is the older genus, and transfer of the spirally coiled forms to the younger genus Heligmosomoides implies that these are derived. The hypothesis that forms of Heligmosomoides in Apodemus are ancestral to those in microtine voles deserves consideration as a more parsimonious explanation of observed data than the derivation of mouse-infecting forms from those associated with microtines suggested by Durette-Desset . In the first place, Apodemus is one of the older murid genera, extending back to a mid-Miocene (10 MYA) origin ,. Arvicolid rodents, on the other hand, are a more recent group, and the diversification of Microtus and Myodes, the principal arvicolid hosts of heligmosomids did not occur until probably 2–3 MYA ,. The Eastern Asian subgenus Apodemus (e.g. A. agrarius, A. latronum, A. peninsulae, A. draco) had separated from the Western Asian/European subgenus Sylvaemus (including A. sylvaticus, A. flavicollis, A. microps and A. mystacinus) by 8MYA , and the Eastern Asian group had diversified by c. 6MYA to give rise to the progenitors of modern A. agrarius and A. peninsulae. It would seem reasonable to hypothesise that H. polygyrus and H. neopolygyrus arose in Sylvaemus (Western) and Apodemus (Eastern) respectively, and that these Heligmosomoides species have been distinct for c. 8 MYA. The western migration of A. agrarius which brought H. neopolygrus into Central Europe has been rapid. Although there are reports of fossil A. agrarius from southern France from 17 000 years BP , it is generally thought that the species was extinct in Europe following the last ice age, and that it has recolonised central Europe within the last few thousand years –. The earliest fossils in Poland date to c. 1000 years BP , and dating of hantavirus divergence suggests that the species acquired Saarema virus from A. flavicollis no more than 1000 years ago . The recent importation of other pathogens into western Europe with this host has also been noted; Hildebrand et al. record a range of unusual Bartonella genotypes in A. agrarius, including some most closely related to Far Eastern isolates. The extent of the secondary zone of contact between H. neopolygyrus and H. polygyrus is unclear. In Poland, the two species occur sympatrically, albeit separated by host identity, and to some extent by habitat preference; H. neopolygyrus was collected from A. agrarius at Wrocław where A. flavicollis sympatrically harboured H. polygyrus. A single worm sequenced by Nieberding et al. but collected from A. flavicollis carried the H. neopolygyrus cytb sequence; some contact between H. polygyrus and H. neopolygyrus in eastern Europe may therefore be possible. Conversely, at the eastern limit of the range of A. agrarius, H. polygyrus-like worms were collected from A. microps (now considered a synonym of A. uralensis) in Urumchi, western China. This species seems able to act as a host for both H. polygyrus and H. neopolygyrus, and its role in maintaining the sympatry between the two Heligmosomoides species in Central Europe should be investigated further. Indeed, there are many records of H. polygyrus from rodents in Western Russia and the Caucasus (e.g. ), which should be re-evaluated in the light of the present description of H. neopolygyrus from central Europe. We would predict that H. neopolygyrus and H. polygyrus have been separated for sufficiently long that they cannot interbreed; however, given that Caenorhabditis species have been shown to produce viable hybrids  across genetic distances similar to those recorded in the present study between H. neopolygyrus and H. polygyrus, this prediction should be tested experimentally. Finally, the present study casts new light in the debate over the specific status of the laboratory model, H. bakeri. Behnke & Harris  highlighted the similarity of H. bakeri and H. polygyrus corsicum at nuclear and mitochondrial loci. In that paper , the H. polygyrus corsicum sequences were based on a ‘composite worm’ and the present work has confirmed the molecular identity in one individual at multiple loci. As presented by Nieberding et al. , H. p. corsicum was a clade within H. polygyrus, despite its distinctness at both mitochondrial and nuclear loci ,, and despite the fact that it had previously been raised to an independent species . It is clear from the present work that this inclusion of H. polygyrus corsicum within H. polygyrus was due to over-reliance on a paradigm that Heligmosomoides in Apodemus represents a single panmictic species , making a study of their divergence an exercise in population genetics rather than in taxonomy. The Nieberding et al. ‘clade 4’ represents the eastern H. neopolygyrus rather than H. polygyrus, and there is no need to invoke a central European refugium for this clade; it was brought to Europe with the host mouse after the LGM. It is also clear from the present work that H. bakeri/H. p. corsicum is the sister group to H. p. polygyrus. From a phyletic perspective this does not confirm the specific status of the two forms, but it certainly rejects the null hypothesis that they form part of a single terminal clade. Further progress in establishing the separate identity of H. bakeri depends on a critical evaluation of the taxonomy of Heligmosomoides from Apodemus and Mus across the region from the Carpathians (the eastern limit of Nieberding’s detailed sampling) to western China, paying particular attention to such areas of high biodiversity as the Caucasus. Given the highly specific nature of the interference with the host immune system achieved by H. bakeri,, and H. polygyrus,, such a study might be an especially fruitful approach to identifying the factors responsible for speciation and host specificity of these important GI nematodes. Heligmosomoides neopolygyrus is recorded for the first time in Europe, arriving as a natural immigrant with Apodemus agrarius. According to molecular criteria H. neopolygyrus and H. polygyrus are not closely related, and H. neopolygyrus may be more closely related to vole-infecting forms. The vole-infecting genus Heligmosomum and the pika-infecting Ohbayashinema cluster within Heligmosomoides. H. bakeri (the laboratory model) and H. p. corsicum are confirmed as the sister group to H. polygyrus, rather than representing an internal clade within the latter species. Molecular analyses carried out by GZ, APH and PDH in Oslo; alignments and phylogenetic analyses by APH and PDH. Morphological work and collection of material in Wrocław by GZ and JH. PDH and JMB conceived the study, MS drafted by PDH with help from GZ, APH and JMB. All authors have read and approved the final manuscript. Support from Zoologica Scripta/Norwegian Research Council for GZ to work in Oslo, and support from the University of Oslo publication fund is gratefully acknowledged. Collection of material in Poland was generously supported by a grant from the Research Council of Poland to JH. We thank all who have provided us with heligmosomid material over the years, including Ian Montgomery (Belfast) for the Kildare worms and Voitto Haukisalmi (Finland) for the Turkish H. p. corsicum material. PDH would especially like to thank Mrs. Katarzyna Pajer at the University of Wrocław, for her master class in methacrylate section cutting.